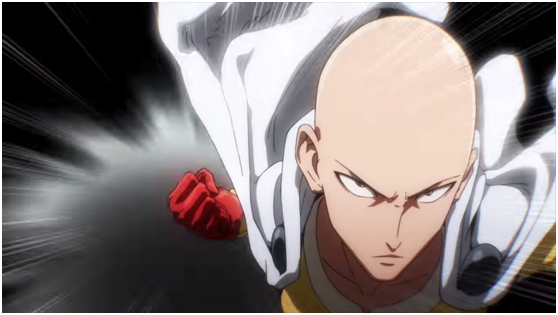 Needed I bring up the recent hot anime One Punch Man? 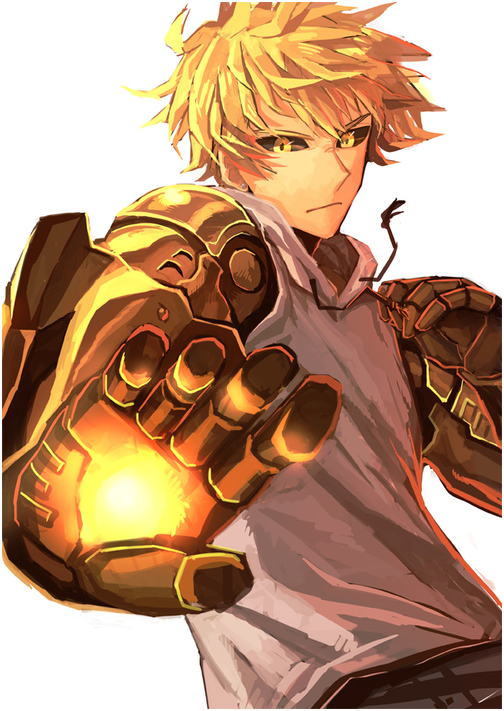 If watched, you can hardly forget Genos, the so-called Demon Cyborg. The transformed body and cyborg arms give him unlimited potential of fighting power, as well as a super cool appearance. 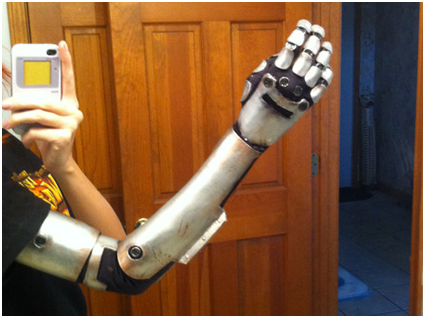 It can’t be cooler to cosplay Genos, but the Cyborg arms may be a barrier for many people. There are many other anime or game characters of unique robot arms, such as Edward from Fullmetal Alchemist, Winter Soldier from Captain America, Gaige from Borderlands. 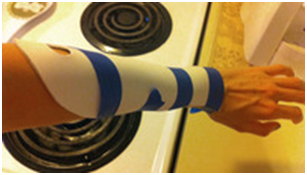 An authentic and quality robotic arm would definitely be an eye-catching at conventions. 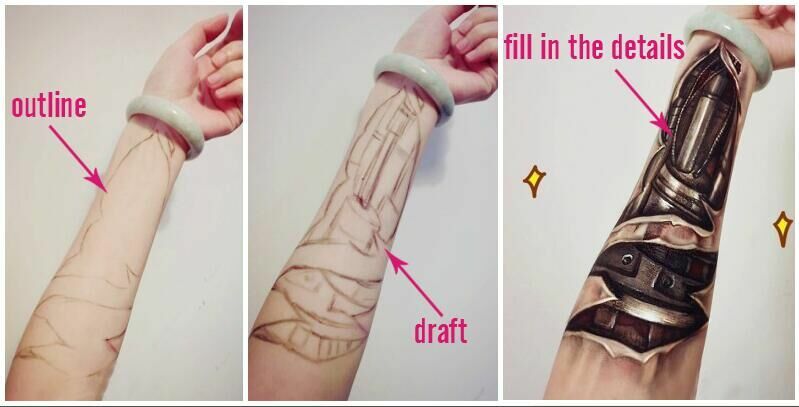 Therefore, we sum up 5 different ways to DIY cyborg arms for cosplay, all easy and manageable, start learning. 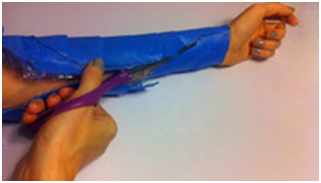 So now follow the steps to make your Cyborg arm by yourself! 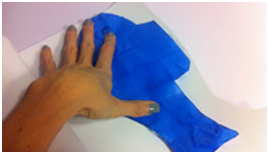 (2)Use paper to make arm patterns, foam and paint for material. 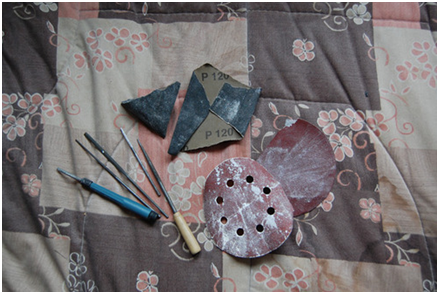 This way is also workable for DIY, be patient and check this process explanations. Vriska as expamle, but we saved the finger part, details you may check the origin. (3) For those who are not good at handcraft, this way is visually simple. Winter soldier as example. 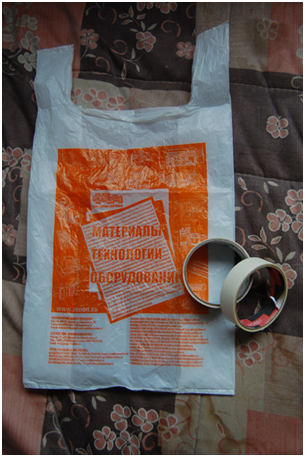 Plastic bags and tape used here (You need an assistant on this step). 1. Wrap your hand with it, in several layers. Cut through with scissors, take off and paste together. Now, you need something to fill this form. We used old newspapers. Now you have your hand’s model! 2. 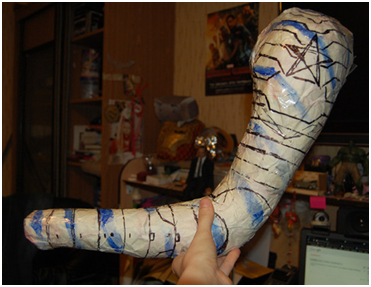 Repeat first step with model’s shoulder, but with masking tape. Don’t forget separating layer, you’ll have to put it off from model later! 4. Took dry putty and mixed it with PVA Glue. It provides strength increase and makes form a little flexible. So, spread putty to cover angles, 2-3mm layer. Wait to full drying. 5. Take abrasive and polish. Repeat steps 5 once or twice to get smooth surface. 6. Draw lines to make grooves. Take a stationery knife or scalpel or something you like and cut grooves. 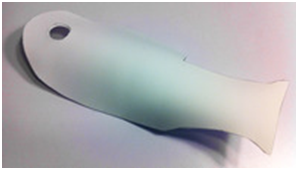 Take round Needle file and make grooves wide and uniform. 7. Cut all the edges. On the inner side cut along. 8. Cover form with PVA. Twice. 9. To join edges on the inner side, stick the elastic band between it. 10. Use Elastic band to fasten it sufficiently, and it looks natural! 11. Forearm was made easier. 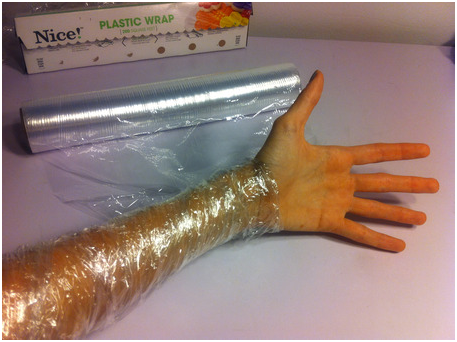 It’s almost conical so I just wrapped model-arm with thermo-plastic. Next grooves like in step 6. 10. Now – paint all with metallic paint with chrome effect. Paint grooves black. 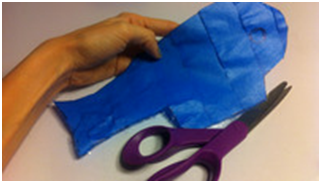 (4) If you want it more wear comfortable and light weight, you can add fabric, foam sheet as material, like this tutorial. (5) Not skilled at drawing lines? You still got way out, draw it on your arm and cut it down. This also ensures arms fitting perfect and comfortable. 1. Wrap your left appendage in plastic wrap. Don’t leave gaps, hair + tape = bad mojo. 2. Now cover that in tape. Fairly snug, but keep in mind that scissors will need to sneak under both the plastic wrap and tape. 3. Draw your pattern directly onto the tape using a sharpie. I had Gaige pulled up on my screen in-game, so I could rotate her and reference the shapes from every angle. I used the plastic wrap and tape method for the main pieces of her arm to get accurate sizing and placement. 4. Cut off your arm…your arm cast! Carefully now! Make sure you are getting beneath all layers of the plastic wrap for a nice, clean cut. 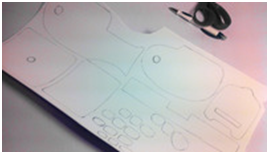 Continue cutting along your lines to produce your pattern pieces. 5. Grab your craft foam and trace all of your pattern pieces onto it. I normally use a regular ballpoint pen to do this. The second image shows all of the pieces that I created and used for my own robo arm. 6. Cut ’em all out! You might want to label the back of the pieces for your fingers to keep yourself from getting them mixed up later. 7. Seal your craft foam in preparation for painting. Craft foam eats paint if not properly fed beforehand. Feed it some Plasti Dip (some may say to shape it first, but the Plasti Dip will flatten it back out anyways). I spray only the right side up (underside won’t show or matter here) of my craft foam. This will take several layers (at the very least…three). Allow plenty of time to dry in between. 8. Once you have properly sealed your foam, it is time to give it some curves. 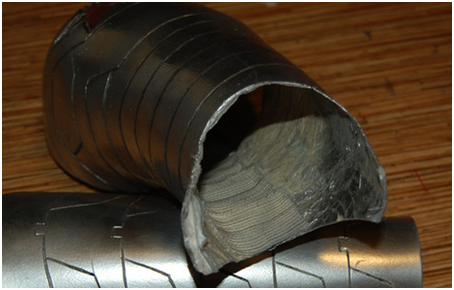 A heat gun works well if you have one, if not, you can carefully heat your pieces over a stove burner. Hold your foam over the heat for roughly 5 seconds. You will feel it get a little floppy and loose. Remove it from the heat and immediately press it to your form and hold in place for 10-15 seconds until it cools. 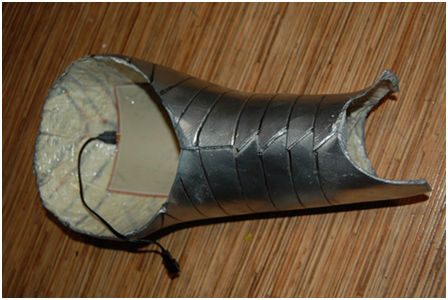 For larger pieces, like the main forearm piece, I taped it in place for easier molding (as pictured). 9. Paint! 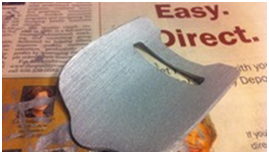 Firstly, Paint the underside of all of your pieces with a thin coat of silver paint. No, we didn’t seal this side so it will look icky, but it’ll give it a touch of color just in case a sliver of it would show for any reason (you can see how porous and grainy it dries in the first photo). Once that completely dries, give the correct side of all of your foam pieces a nice coat of silver paint as a base (if sealed properly, this should dry much smoother). From there, I used the acrylic paints shown to weather and finish off my paint job. I also snipped the back off of fifteen metal brads and painted them black. 10. Seal! 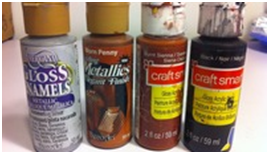 Give all your painted armor pieces a thin coat of crystal clear, as well as the metal brads. Don’t go too thick to allow for flexibility. 11. Now glue all the things together! Engineering at its finest! Start by hot gluing all of the metals brads (or whatever you’ve chosen to use here). the black glove may be used here. I mostly placed my metal brads along the knuckles, so they’ll peek through the individual finger armor pieces. I glued down all of the hand pieces first and worked my way up the arm. Now, you are getting closer to be a Mechanic Master! 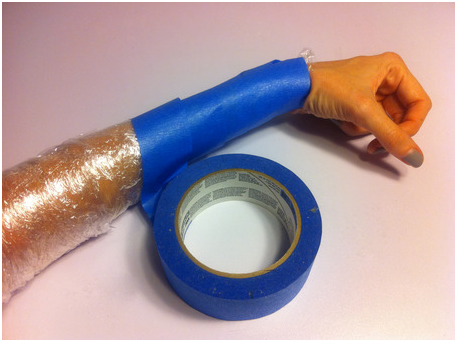 We will also share some more tutorials practical and special to solve the Genos’s arm. You may wonder how about the bald head of Saitama, well; head shaven isn’t the favored way. Follow us, we soon will provide you a fresh and simple method of disguise.